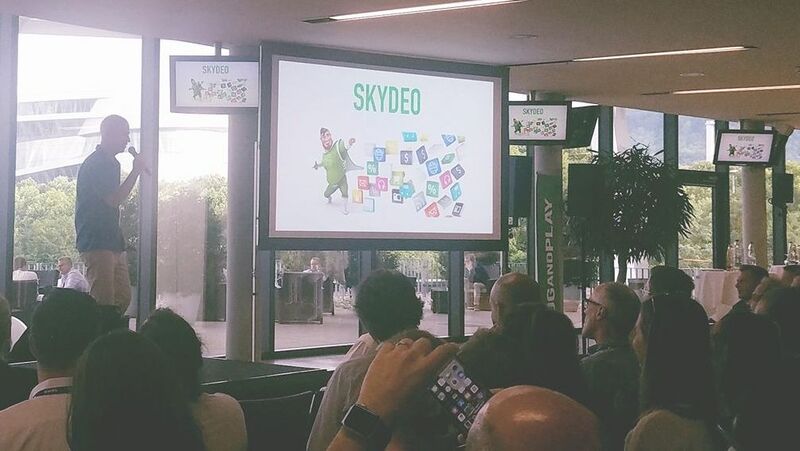 Skydeo COO Eric Simon presented Skydeo’s AppGraph & PlacesGraph solutions for a packed house at Mercedes Arena in Stuttgart today. Skydeo’s unique mobile insights helps auto makers better understand their car buyers mobile interests and behaviors in different regions around the globe. Skydeo’s Eric Simon presenting in German at Startup Autobahn. STARTUP AUTOBAHN is the ultimate innovation platform that unites global young tech companies with the unrivalled tech expertise of Silicon Valley and the best of German engineering. We are a neutral innovation platform moderating an in-depth and curated collaboration between our partners from the industry and young tech companies. Our network of investment firms and mentors further helps the growth of tech companies. Our home is Stuttgart – the birthplace of the automobile, one of the leading IP regions of the world, and a hub of business, engineering, and groundbreaking inventions. Our namesake is the high-speed German highway – the only one in the world without a speed limit. And just like the Autobahn, STARTUP AUTOBAHN is about accelerating joint projects between young tech companies and our corporate partners. STARTUP AUTOBAHN partners and attendees included: Plug & Play, Daimler, Porsche, Hewlett Packard Enterprise, DXC Technology, BASF, ZF Friedrichshafen, Deutsche Post DHL Group, Webasto, Murata, HELLA, BENTELER, The Linde Group, AGC Glass, Wieland, PostNL, Jardines Matheson, CEPSA, and Covea. Want to own a Tesla? Start investing! 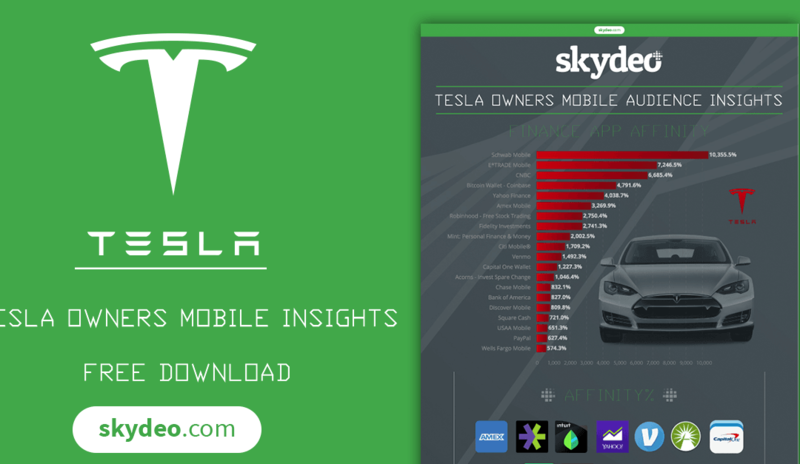 In a recent panel study of 340 million mobile users, Skydeo analyzed Tesla car owners mobile app interests compared to non-Tesla car owners and the results are intriguing. Tesla owners were 72 to 103 times more likely to have Charles Schwab or eTrade Investment accounts. The image of Tesla owners as tech savvy, high income individuals is supported by their use of Bitcoin (48x), Robinhood (27x), Mint (20x) and Venmo (15x). Tesla owners have a high propensity to use food & delivery apps (62x) and shopping apps like Amazon Prime, Best Buy and AliExpress. Surprisingly, Tesla owners have a cost conscious side as they used coupon shopping apps like Slickdeals, Key Ring, Groupon and RetailMeNot. Skydeo Insights enables brands to analyze users by traditional metrics like age, gender, income, home ownership plus mobile segments like apps, locations, device, carrier, etc. Skydeo limited this analysis to finance and shopping apps. Edmunds, the California-based car-buying platform, examined registration data of all 1,600 Tesla Model S vehicles that have ever been sold in the pre-owned market in the U.S. Edmunds also found that owners of used Model S are younger. About 10% of pre-owned Model S buyers are millennials, ages 18 to 34, compared to just 6% of those who purchase a new one. An Edmunds analysis released earlier this month found millennials are leasing vehicles at higher rates than the overall car-buying population and they’re opting for more luxurious, tech-forward cars than they could otherwise afford to buy. Millennials are particularly attracted to leasing Ram, GMC, and Lexus brands. California’s share of used Model S sales is only 30.5%, compared to its 42.5% share of all new sales, according to Edmunds, which examined registration data of all 1,600 Tesla Model S vehicles have ever been sold in the pre-owned market in the U.S. The Tesla brand has migrated into different age and earning demographics. Some 36% of all used Model S buyers earn less than $100,000 a year. Only 25% of new Model S buyers have salaries under $100,000.